Comfort & Security: Car with “Faces In The Clouds”™ Packet – Kim's Kreations, Inc.
Use Kid Friendly® Pocket Puppet Reading Pal™ on the finger to easily flip pages. 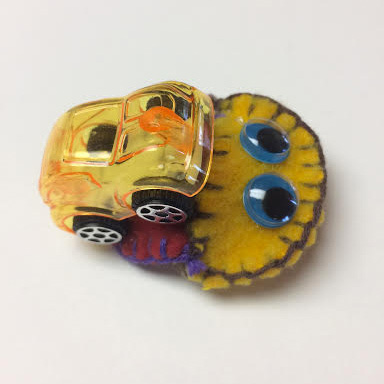 The car represents the “safety and security in structures” as found in Level #2 of the pyramid, “Complex Structures.” No Licking, Just Flipping™ keeps an individual’s environment safe from past germs of others. Comes with “Faces In The Clouds” packet containing Faces and Add-Abilities. Easily customize Pocket Puppet Reading Pal™ by including the human senses as described in Level #1 of the pyramid. Pocket Puppet Reading Pal™ is great as a finger puppet, but children love using as a slipper for the finger. Choose Slipper Flipper™ before adding to cart. Add a ribbon to the Pocket Puppet Read Pal™ and use as a bookmark!